Hot air sky lanterns (Kom Loy) being released by the hundreds fill the night sky. 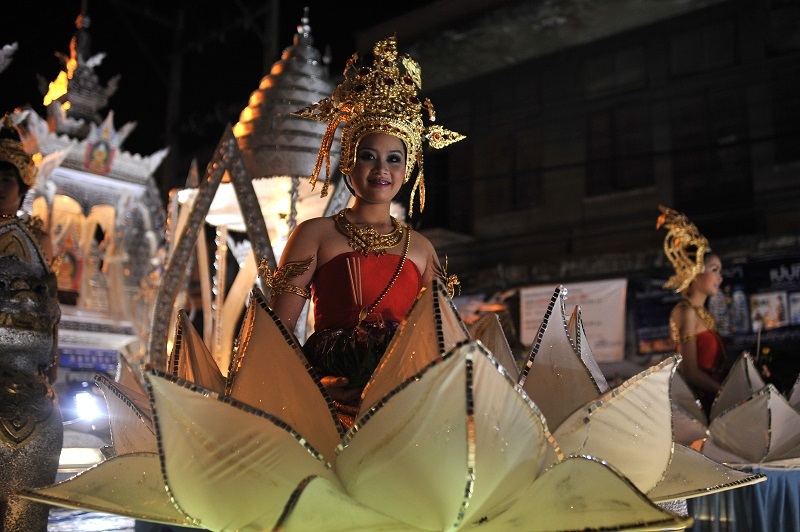 People in traditional clothing release small intricately made banana leaf boats with candles, incense, flowers and offerings in rivers, streams and canals. Fireworks boom on throughout the night as parades fill the streets with music, floats and beauty contests. There are firecrackers popping away everywhere, dancing and plenty of drink to be had. When Thais do a festival, they do it big! Loy Krathong, although traditionally a northern Thai festival, is now celebrated throughout the country. 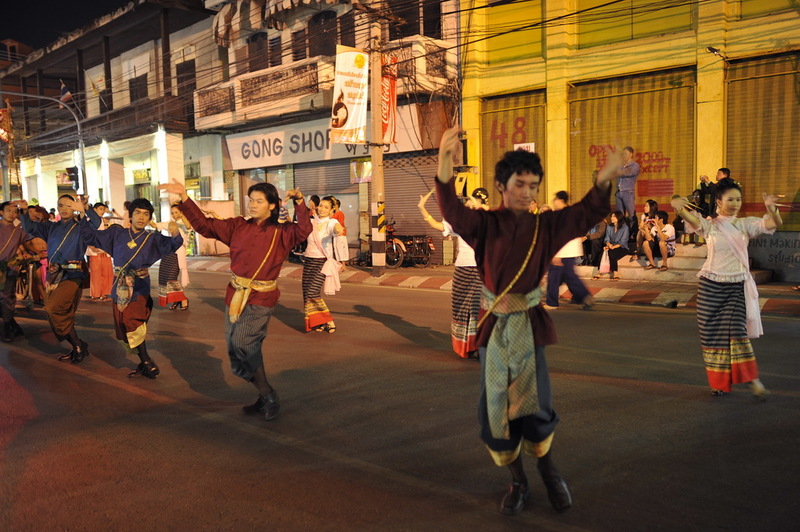 It takes place on the full moon day in November, and although it’s only one day, people prepare long in advance and normally end up celebrating for multiple days. This year’s festival is being held on Thursday, the 21st of November. It’s a pretty big deal over here in Thailand, and even Thais that live abroad will celebrate by making and releasing krathongs, the small, intricately made banana leaf boats, into backyard baby pools, and even bathtubs. It’s believed that the river, or as Thais refer to it as “Mother River” provides life, prosperity and fortune. As we use the river throughout the year to better our lives, we will take this day to give thanks to “mother river” and give some prayers of thanks, and for hopes of things to come. 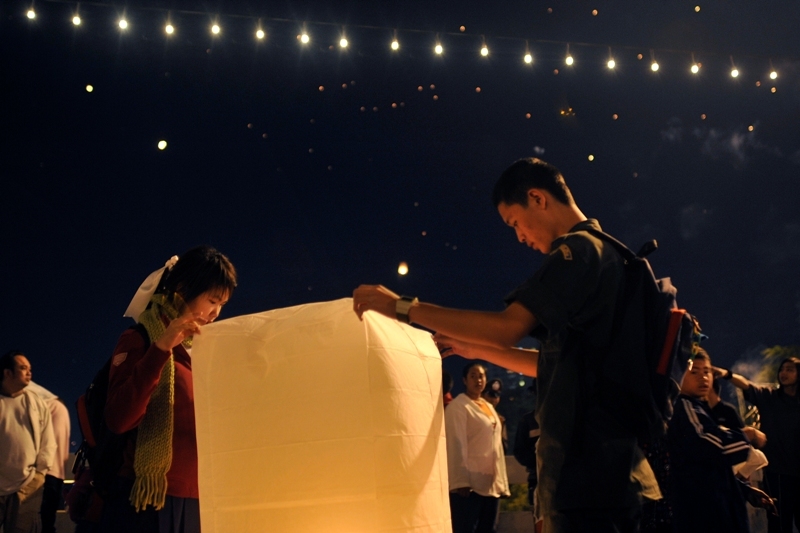 Releasing a krathong is normally done with close friends, family members, or your boyfriend or girlfriend. It is a big thing if you are interested in someone, and invite them to release your krathongs into the river together. What if she says yes? How exciting! What if she says no? Will I have to release my krathong with mom again this year? Urghhh. Although Loy Krathong is one of Thailand’s biggest festivals, it is not actually a national holiday. Schools, banks, and government offices remain open, but not a whole lot of studying and work gets done. Our Teaching Volunteers here in Thailand see that for students, it’s actually fun to go to school on Loy Krathong. All you do is play around all day, make krathongs, have parades, and try to light a fire cracker when the teacher isn’t around. Although the technical focal point of Loy Krathong are the krathongs, Kom Loys (the hot air sky lanterns) take a very close second. In the not so distant past of just a few years ago, you could buy and release kom loys anywhere at any time. Due to the dangerous nature they present to arriving and departing aircraft, there are now strict locations, dates and times where one can release these beautiful, but dangerous items into the night sky. Chiang Mai airport is cancelling or re-scheduling over 70 flights during the evenings around Loy Krathong for safety. It’s not unusual to wake up the day after Loy Krathong and find burned out kom loy on your roof, car, front yard, electrical lines, everywhere really. They are disposed of quickly as things get back to normal in the day or so after the festival. Although nobody gets a whole lot of sleep during these couple of days, due to all the commotion, it’s still a really fun and interesting festival to observe and be a part of. Even with the decrease in flights to Chiang Mai, tourists still find their way here in big numbers, and the hotels and guesthouses are full of visitors to be a part of the action.